Role > This was a start to finish job. I designed several solutions. Flowed and formatted all text and information into templat. Chose, and color corrected all images. Developed and formatted all graphs. Worked closely with the client throughout the project. Objective > The objective of this booklet is to provide information about the higher education loan market and the student loan programs that play a vital role within that market. 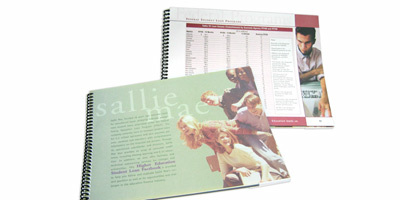 The factbook is a quick reference partner piece to the Sallie Mae Annual Report. Results > This factbook was provided to investors, and prospective investors. It was a helpful quick reference for Sallie Mae's distribution of funds.